Mark your calendars now! This year’s annual golf tournament is set for Monday June 19th, 2017. 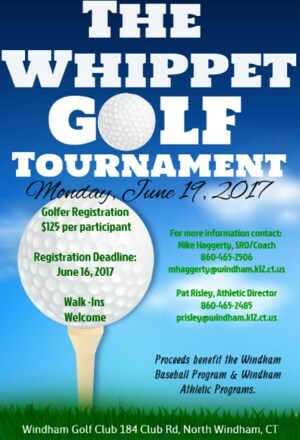 The Whippet Golf Tournament has become a tradition for many people in the Windham Community. We encourage you to invite fellow alumni, co-workers and friends to join us this year with the confidence that it will be a memorable day. We want to continue to make this a special occasion and would like your help in making this year’s event one you will be talking about until next year’s tournament! We’re looking forward to seeing you on June 19th at The Golf Club at Windham in North Windham CT.